When it comes to properly installing crawl space insulation, there’s a right way and there’s a wrong way. Today, we’re going to discuss the right way. Most homeowners know that insulation is a good thing. What most don’t know is how to correctly add insulation to improve your energy efficiency in the home. First, if your crawl space is not correctly encapsulated, you’re not going to get the desired results you want. Until your crawl space is properly sealed, you’ll continue to have issues keeping your environment controlled. Now, I know there’s a lot of different crawl space insulation types out there that can be used and what you do use is your call. However, if I may, I want to recommend Rigid Foam Insulation. This insulation type is a high quality type that will absorb far less moisture than spray foam insulation. So do keep that in mind. Now that you know what insulation to use, we need to cover how you can properly install your crawl space insulation. Your insulation is to be placed against the foundation walls. Once your insulation is in place, you’ll then take your crawl space vapor barrier and cover the insulation. CrawlSpaceRepair.com gives us a great example to do this. 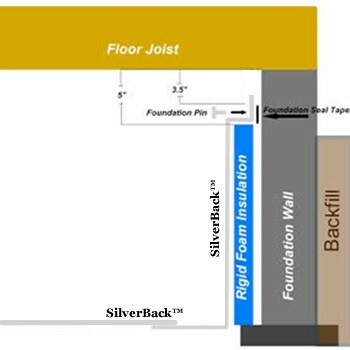 In this example, we can see that the SilverBack crawl space vapor barrier is used to cover the Rigid Foam Insulation. The vapor barrier is held in place with foundation pins and foundation seal tape. What Type of Vapor Barrier Should I Use? Since we’re talking about the SilverBack vapor barrier anyway, some of you may be wondering what type of vapor barrier brand you should use. The SilverBack is American made and produced by CrawlSpace Concepts. There’s no question that it’s one of the top tier vapor barriers on the market. After years of installing this very same crawl space liner, I’m extremely confident that it works and will last for decades. Until you can properly encapsulate your crawl space, you’ll likely continue to have trouble controlling your home environment. Even after the crawl space is encapsulated, you still need to eliminate the moisture in the air. For this, you’ll be required to get a crawl space dehumidifier. In order to get create a conditioned space, there’s a few more steps you must take. Conditioning the space can be done in two different ways, either altering the dew point temperature, altering the air temperature or doing both. Encapsulating your crawl space solves one and a dehumidifier will solve the other. The dehumidifier will help bring down the humidity of your crawl space and reduce the moisture in the air. In return, you get liquid water. To remove the water, you can get a sump pump. Nearly all American homes have floor joist, also known as your crawl space ceiling. While you may think insulating your floor joist first, you’re wrong. In fact, the moisture in your crawl space could be the reason why your insulation is failing. You should never insulate the floor joist first. This should be done only after the crawl space has been completely sealed and moisture removed. In order for your fiberglass insulation to work properly, you need two things. One, you need to make sure the insulation is in a clean place. Two, you need to make sure there’s little moisture in the air. Period. Yes, foundation vents open and close. However, closing your foundation vents is not enough to protect your crawl space from the outside elements. Foundation vents need to be sealed completely. Don’t forget to make sure you check all building codes in your area. Building codes can differ from one location to the next, so be sure to do a Google search to make sure you’re following the codes. If you have any questions about properly installing crawl space insulation, be sure to leave me a comment or reach out to me via my contact page.